Fortnightly Poem (usually longer than the Weekly variety). And pierce the darkest night. In the word of an engineer. Where the cavernous tunnel lies. Of the man in a draughtsman's cell. That he has in an engineer! This fortnight's poem can be found at this link. Please click here to download or listen to my recording. Categories: Fortnightly Poem, LibriVox | Tags: 2014, free, James Weldon Johnson, mp3, ogg vorbis, poetry | Permalink. Troops of joys are they, now departed? Winged hopes that no longer stay? Powers that have linger'd their latest day? Dim farewells—the last, the last? See, I am ready, Twilight voices! O speak plainer! O draw nigh! Quick, let us go,—the day is past. This week's poem can be found using this link. 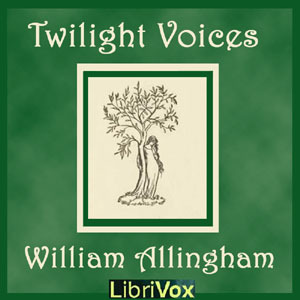 Categories: Fortnightly Poem, LibriVox | Tags: 2014, free, mp3, ogg vorbis, poetry, William Allingham | Permalink. This was the fortnightly poetry project for December 1st to December 15th, 2013. Clement Clarke Moore (July 15, 1779 – July 10, 1863) was an American Professor of Oriental and Greek Literature, as well as Divinity and Biblical Learning, at the General Theological Seminary of the Protestant Episcopal Church. He is the author of the yuletide poem “A Visit from St. Nicholas”, which later became famous as “‘Twas the Night Before Christmas”. This poem seems to be a ‘moral’ version of “The NIght Before Christmas”. Categories: Fortnightly Poem, LibriVox | Tags: 2013, Christmas, Clement Clarke Moore, free, mp3, ogg vorbis, poetry | Permalink. This was the fortnightly poetry project for November 10th to November 24th, 2013. Categories: Fortnightly Poem, LibriVox | Tags: 2013, free, mp3, ogg vorbis, poetry, Will Carleton | Permalink. This was the fortnightly poetry project for October 20th to November 3rd, 2013. At this time of year, we dedicate the Fortnightly Poetry project to the fallen in war. This poem, written at a time when the average life expectancy of an officer at the front was a mere six weeks, vividly demonstrates a young officer’s expectation and acceptance of his own death. Categories: Fortnightly Poem, LibriVox | Tags: 2013, free, mp3, ogg vorbis, poetry, Rememberance Sunday, Richard Molesworth Dennys | Permalink. This was the weekly/fortnightly poetry project for August 18th to September 1st, 2013. Categories: Fortnightly Poem, LibriVox, Weekly Poem | Tags: 2013, E. Pauline Johnson, free, mp3, ogg vorbis, poetry, WP week 34, WP week 35 | Permalink. “The Demon of the Gibbet” by Fitz-James O’Brien (1828-1862). This was the fortnightly poetry project for February 10th to February 24th, 2013. Categories: Fortnightly Poem, LibriVox | Permalink.